Elegant upholstered bed with soft upholstered, low headboard. The formal statement regarding the Thread Bed acts very familiar as well as exciting at the same time. The generously upholstered headboard is divided in the middle by a very marked thread which is interlocked through a clasp. The Thread bed - in the version offered here with a filigree metal frame and padded headboard in 2 different heights - can also be ordered as Thread Wood with a solid oak or walnut frame. 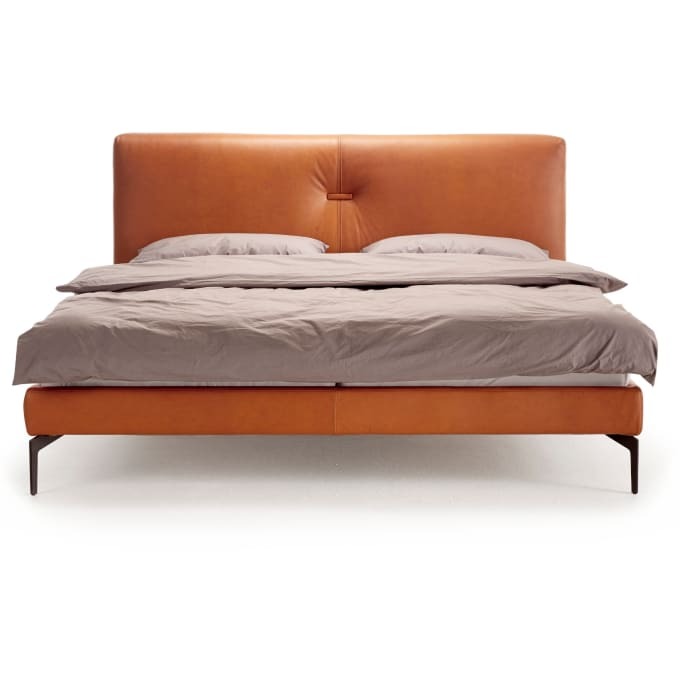 The Thread upholstered bed with its simple, all-round bed sides is available in various fabrics and leathers from the Möller Design collection. The headboard is supplied with a fixed cover with tensioning fabric on the back. The sides of the bed have a removable velcro blind. From a bed width of 160cm Thread is manufactured with middle support and support leg. Do you have a question about "Thread"? How can we contact you?